This year has gone so fast that it felt like I barely ramped up again after marathon de Paris in April, before I was jetting off to Norway. We set off on Friday morning (01.00hours) on a National Express coach. I was a bit puzzled as to how our arrival time at Gatwick was 7am. Until I realised that we were visiting all of the London airports before getting to Gatwick, through Thetford and Cambridge. We trundled around the M25, visiting Stansted and all of Heathrow’s terminals before finally pulling into Gatwick at 7.30am. Bleary eyed and a bit stiff, we headed in to get breakfast. We had a flight at 9:20 to Oslo, for a connecting flight to Tromso. The flight from Gatwick was delayed by half an hour, and then by another half an hour. We were inching ever closer to missing our connecting flight in Oslo, which made it a bit more stressful than I would have liked! We finally took off just before 11am, and as Olso is an hour ahead, this meant our window was very small indeed. 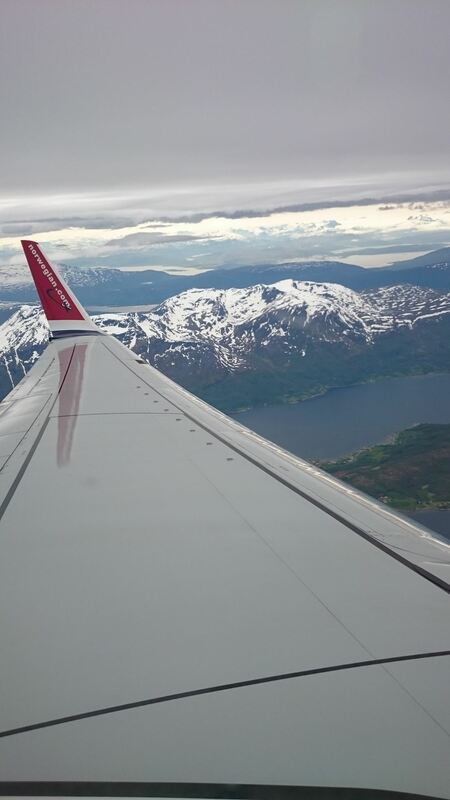 So small that there was an announcement for the passengers with connecting flights – the Tromso flight would be held for us. For fifteen minutes. We were also unsure on whether our bags would make it on to the flight. Here’s an important lesson for you all, if you don’t know it already: if you are racing abroad and are out of sight of your luggage, PACK YOUR KIT in your hand luggage. Or wear it. Whatever makes you happy. I had helpfully packed all of my kit neatly into my suitcase. After a nailbiting couple of hours, we landed in Oslo and had 15 minutes to get through security (again) and try to locate our suitcase (maybe, the announcements were a bit confused). After five minutes at the carousel, we asked a couple of bored looking airport employees if our bags would come out or go straight to the next flight, and they shrugged a bit and told us they would go straight on the flight – the opposite of what we’d been told. We legged it to security and stood in the queue, panicking gently, which is always what you want when you go through airport security. Thankfully we made it though relatively unscathed, although I lost the bottle of water I had yet to open, that I bought in Gatwick. Boo. We ran to the gate and hopped on the flight with moments to spare, before realising that it was only half full and everyone we’d sped past, was trickling on. Clearly, they had decided to wait for everyone else. This turned out to be excellent news as a bringer of excellent news popped his head round the plane door to announce that all bags had been retrieved and were om the same plane. Hoo-ray. The rest of the two hour ish flight passed in a blur of reading and napping, until suddenly we were passing over beautiful snow covered mountains. I got a bit confused on the way back, and thought we were flying over Scotland on that fight! 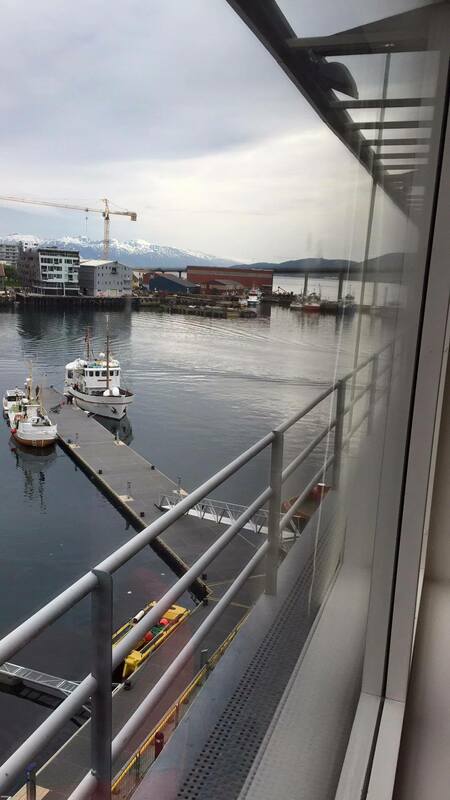 Tromso is one of the most northerly cities in the world, and is actually inside the Arctic Cirlce. At this time of year, as you may have guessed from the title of the race, it never gets dark. The weather wasn’t great and the temperature hovered around 6 degrees C, and it was a bit overcast. I’m not sure it would have been blazing sunshine if it had been a bit less rainy though – the light seemed to be perpetual twilight. The other thing about Scandinavia is it’s expensive. Boy, is it expensive. If Sweden can be likened to petrol garage prices, then Norway is the equivalent of a West End cinema concessions stand. Phew. Beer can be touching £10 for two thirds, and a pizza cost me nearly £20. Both were delicious, of course. We ate at Casa Inferno, a steampunk themed pizza and beer place. I had absolutely no problem with this perpetual twilight, and I was out like a light as soon as my head touched the pillow in the Scandi hotel. Breakfast was included in the price of the hotel room, and was a glorious buffet. I ate far too much on Saturday, but I couldn’t resist. 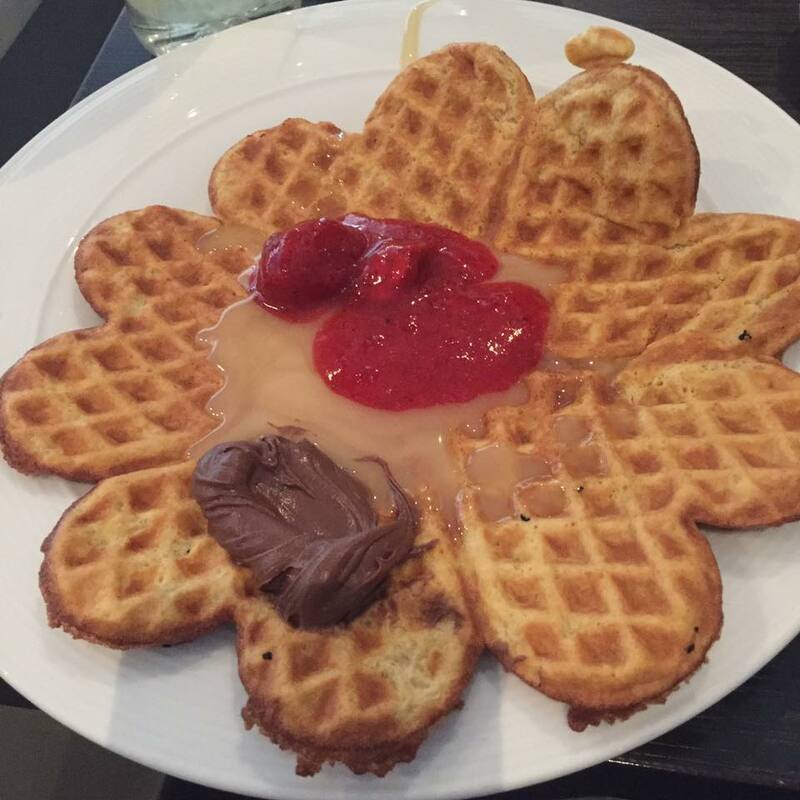 Hot food, home made baked beans, cheese and bread, smoothies, pancakes and DIY waffels. Delicious. Our group then headed out to pick up race numbers and do some shopping at the expo. Tromso is small. You can walk pretty much everywhere and the airport is a couple of miles away and is walkable too, if you feel so inclined. It’s not exactly pretty though. We found the expo after getting mixed up between City Hall and County Hall (something common in Norwich too). There wasn’t much expo – a couple of racks of running clothes and a table or two of mugs, bottles, beanies etc, all branded with the Midnight Sun Marathon logo. I couldn’t resist the gilet and a snazzy water bottle, and I was relieved to find that the t-shirt fitted as that was pre-order and there were no size guides available. I sized up based on the fact that they would probably be quite fitted – Amsterdam, Paris and Stockholm race shirts are. Race packet pick up was smooth and they even checked your chip, courtesy of a very polite, very enthusiastic small boy and a scanner hooked up to a PC. The goody bag had a buff in it, sponsored by a Norwegian drinks company. After that we had a small wander, then sat down for lunch at 1pm. Lunch was pasta, as per usual for a carb load. I was still pretty full from breakfast but decided that I should eat as I wouldn’t have anything else before the race. The pasta was nice, the restaurant was spacious and the staff friendly. Following lunch, our team headed back to the hotel for a rest before reconvening at 8pm, for the race start at 8.30pm. 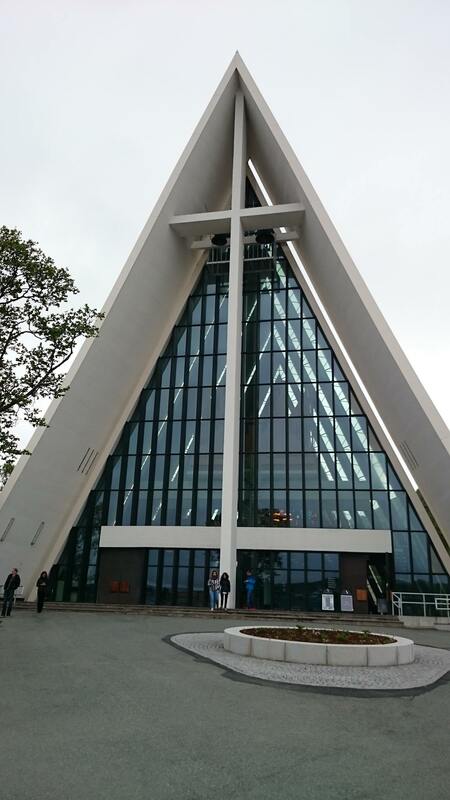 Honestly, nothing is far away in Tromso! We ate at Egon, found here. I actually managed to sleep properly for an hour or so, which was very refreshing. All set in my capris and a vest, I went to the hotel reception. There were a lot of runners there as it’s a running weekend – as well as the full, there’re also half, 10k and fun run for the family. Alongside that, the Royal vessel had moored right beside the hotel, so we got to see the King and Queen of Norway alight a couple of times over the course of the weekend! The field for the marathon is relatively small, about 1000 people. The half marathon is about 4000, and set off two hours later. The route is interesting in that the second half is the half marathon route, so just as I was flagging a bit, suddenly all of these fresh runners were around me, which was great. 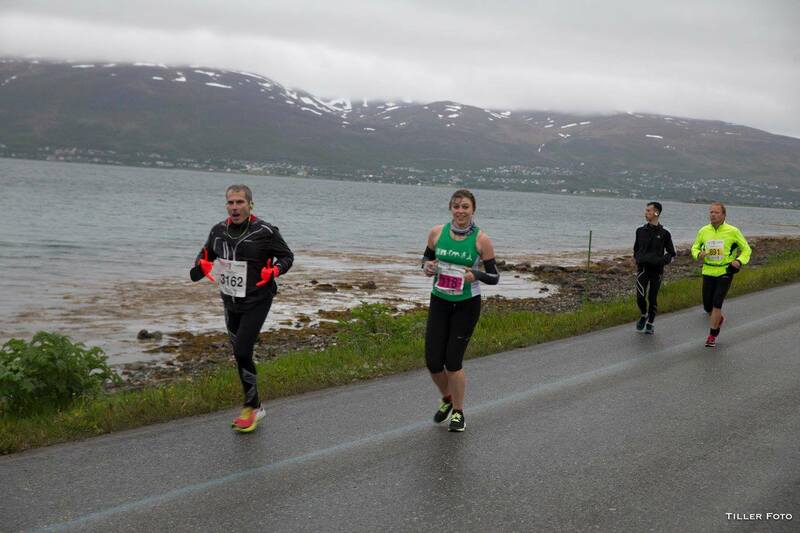 I enjoyed running past people doing the half marathon – it’s a great confidence boost! The gun was fired and we were off. 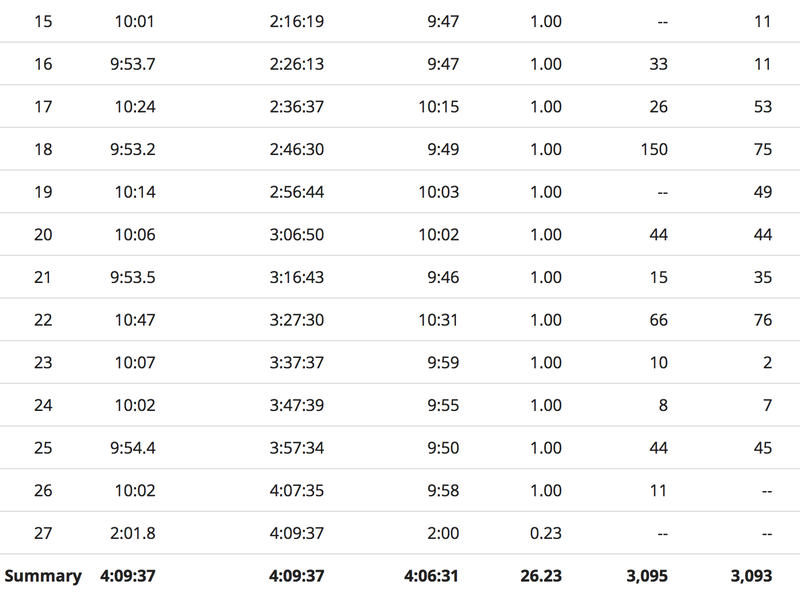 In terms of training, I felt that I had forgotten to ramp up after Paris marathon in April, although I have stuck to my usual 30-35miles a week and had some good races and long runs in there. My longest run had been 21miles, but as this race only had one goal ‘Enjoy Yourself’, I was interested to see how it would feel. 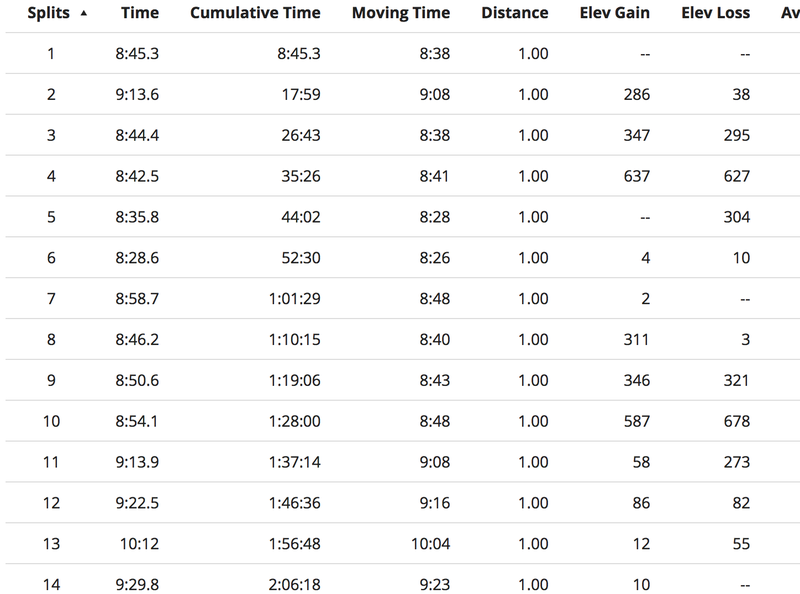 For the first ten miles, the only mile where I was slower than 9min/mil, was the one where we went over the bridge. I felt so confident and effortless, I kept checking my watch to make sure it was right! After that, a bathroom pitstop was in order and when I started again, I realised my rhythm had been disrupted and to return to that pace would mean too much push and not enough enjoyment. I loved this race. Every mile was great and while it wasn’t easy at all, I felt so in control – it was the opposite to Paris, where I had this big Sub 4 goal looming over me and a sudden 25 degree heatwave. I talked to the people around me, waved to the spectators (who were really kind and vocal, especially when they saw my marathon bib) and tried to take in as much of the race as I could. The terrain is quite bleak – it’s starkly beautiful anf the church on the other side of the bridge is breathtaking, and could easily be featured in the next Scandi-Noir drama. 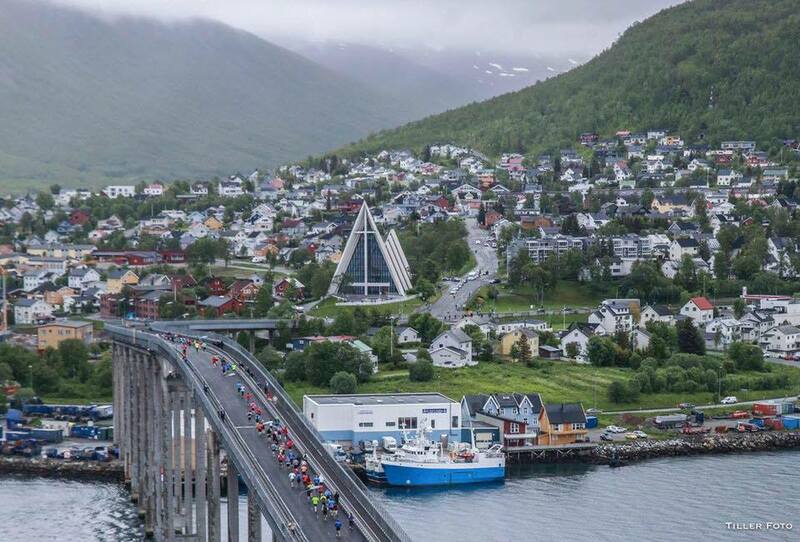 All too soon and the finish line was coming up fast, through Tromso’s high street. I found an extra bit and sprinted to the finish line, where I was given a beautiful medal and two people tried to give me a space blanket at once. I then proceeded to hyperventilate at the relief of finishing, the satisfaction of finishing the race, and just being overwhelmed with the people around me. After a few seconds I was fine, and passed the athlete’s drinks table and the big screen, on the way back to the hotel. I walked along past the finish line, and was so pleased to see the finishers inches away from their medal and space blanket too. 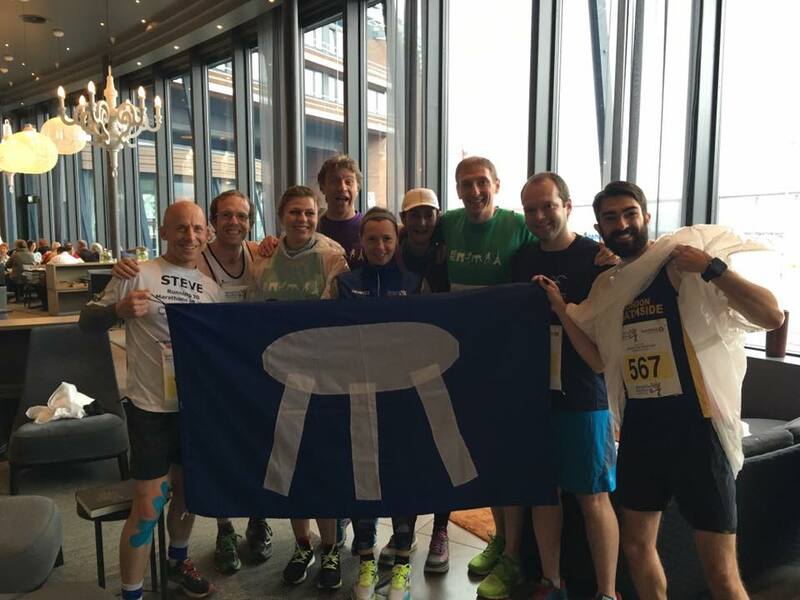 It was a once in a lifetime experience – finishing at about 12:45 was really strange. Mingling with drunk people having hobbled to your hotel, is really weird. It was great though. My one regret is not buying food to eat afterwards – we had a packet of biscuits and a bag of crisps along with a couple of cans of beer. I chose sleep over food as the rest of the gang went out in search of Burger King – this was a bad move as I woke up feeling really hungover! Luckily, the breakfast sorted me out, swiftly followed by a local delicacy – cinnamon bun. Congrats on the race and great recap! Love reading the race-travel reports, it’s sort of one of the themes of my site as well though based in the US. Sounds like an amazing adventure in Norway! Look forward to following your site…Cheers! Sounds like it was a great race! Well done!